A few years ago, Kendra of Preschoolers and Peace mentioned that she did all her school planning once a year, at the beginning of the year. She didn’t plan or organize or pull sheets monthly or weekly; she just did it all in a big, whole-day smash with a friend. This appealed to me. At the time, I was only doing K or 1st grade, and so didn’t really need any elaborate laid-out plan, but I kept the idea in the back of my mind. If I was to find the perfect fit for my skills and temperament in education, it would be as a school administrator and board member, not as a teacher — especially an elementary school teacher. So, for me, a huge do-it-all-at-once planning and organizing process fits best. This is the third year I have attempted it, and I’ve figured out a lot of kinks and tricks along the way. I make our plan for the year, print and file papers, ready books, and layout the plans before we begin. However, I don’t keep track of “attendance,” or grades. I am apt to forgo the plan if the boys are caught up in a book or topic or project that is in keeping with my goals but not done in the manner or at the pace I had anticipated (for example, as I write this it is Saturday and my 6yo son picked up the Covenantal Catechism book we did last year and is reading it through. I find that just as valuable — if not moreso — than me leading them through it). I don’t care about “making up time” or finishing books by the end of the year (or before the end of the year). When it comes to educating elementary students at home, my metaphor is art and dance rather than punch cards or production lines. I do need a plan, but the plan adjusts to the students and life. We don’t stress over fitting life and the students into the plan. The plan is the path forward, the reminder of our direction and goal. So, for the next two weeks, excluding Mondays and Thursdays, I will be covering my process for planning out our homeschool year, all at once. I planned my year out a few years ago. It took me all summer, so I’m looking forward to reading your tips and seeing if I can streamline the process. I hope you find zome useful tips, but also do keep in mind my oldest is only 3rd grade right now. “Do the next thing” is easier with all young students than when they get older, I imagine. Right now we aren’t keeping up with anyone or anything. That will change when we enter middle years and join or host group things. I am so not a planner! I love the idea of having a year long plan though and wish I could stick with it. We are doing preschool this year and kindergarten next, so still trying to find my groove. Thanks for the tips! Hmmm….something to ponder! I’m not quite as organized as this – I read through your posts – but I definitely make goals and have ideas of how the year should go. I am considering doing 6 weeks on / 1 week off next year, but the kids like getting done in early May to have a LONG summer break. (We don’t school year-round.) Perhaps I should start with that CALENDAR! LOL Thanks for sharing! Looking forward to seeing what you post in the future! You sound so much like me! 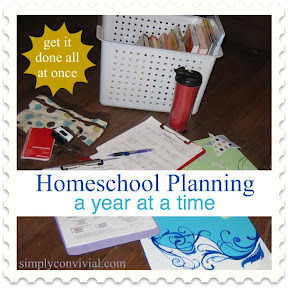 I desperate for a year long day by day plan that I can use as a loose guide/overview for homeschooling my ds6. I would love to see some sample plans like this is any exist but I can’t find them online. I’ve set up an excelle sheet that I just need to fill in the boxes for each day of each week for the whole year but at the moment other than a couple of workbook pages a day I have nothing! I need direction and samples to kick start me into gear.